To cater security is a big responsibility on Secura Security which never neglected; we always make sure that when clients come to us for the purpose to hire security guards, bouncers, or female security guards, we never disappoint them with ordinary services thus we have arrangement for trained security officers from retired Indian Air Force officers. Before putting security guards on client duty these proficient retired officers teach them the way to overcome sudden physical threats which includes unarmed fighting, drill, physical conditioning. The highly experienced retired Indian Air Force officers prepare trainees to deal with bomb threats, fire, dacoity, drunkenness, harassment, physical injuries etc. 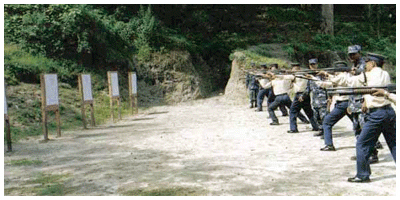 They are given training to deal with immediate difficult situations without loss of time. Owner of Chettinad Villa in Greater Noida, spoke, "My home resides in one of the most life-threatening places of the city; I recently shifted from Pune. After reaching here my focus was provision of security to my family which includes two teenage daughters and my wife. Luckily, I am blessed with couple of security guards for my place on 24-hour duty and five for my office. They are efficient and serious towards their duty. Thank you always."